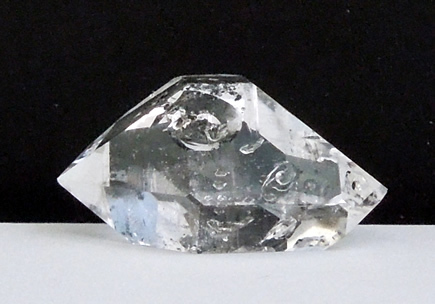 The fluid filled pocket (incorrectly called an enhydro) in this Herkimer Diamond crystal is seen clearly with the naked eye, many times a loupe is needed to see them. 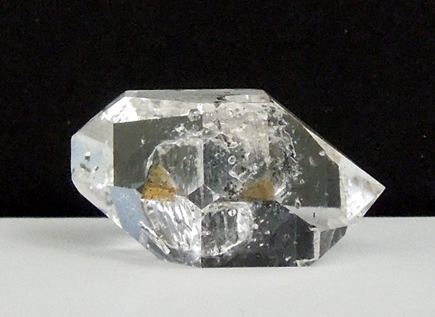 By tilting the crystal gently, back and forth a bubble is seen moving inside the tiny pocket of trapped water, located towards the chisel tip side of the crystal. The pictures directly above and below capture it. Look towards the central, right area in the pic above. The picture below shows it in the same area, but towards the top. Look for the bubble of water with a small bubble inside. The water, by the way is well over 500 million years old ! 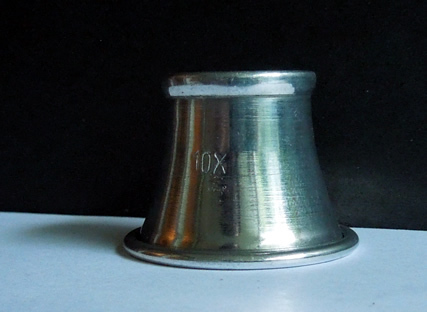 A loupe is included (pictured below) to really appreciate it. 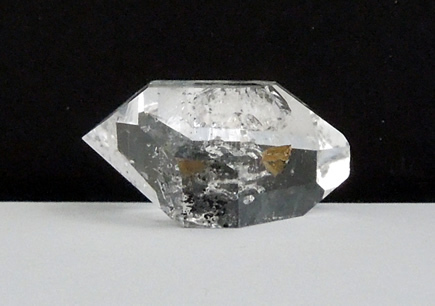 When using an eye loupe, place the loupe against your eye and move the crystal to focus. 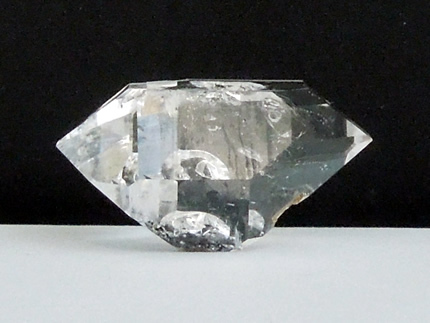 This is a complete double terminated quartz crystal. One point is the traditional sharp tip, the other is a flat chisel tip. 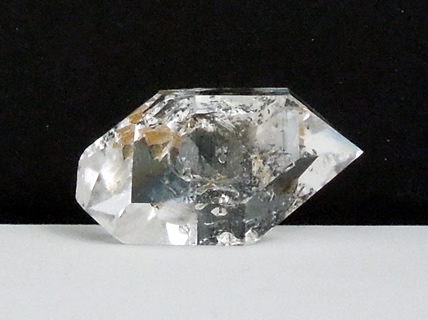 Clarity is very good, much better than the pictures show. Externally two divots really reflected in the images. They are most likely fluid filled inclusions that popped with temperature changes. 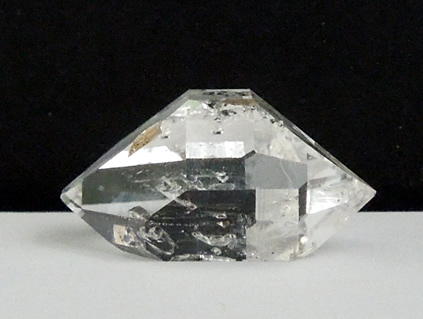 A sprinkling of black anthraxolite / hydrocarbon is present on one facet. A window face is present as well, see the second picture below. 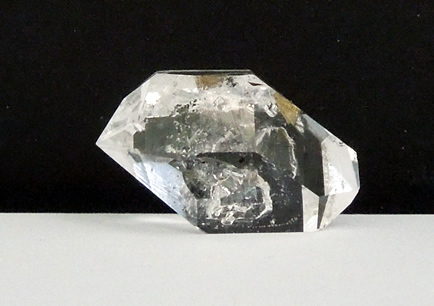 Internally, other than the fluid filled inclusion (enhydro), this Herkimer Diamond crystal is fairly clean. It's a quality specimen. 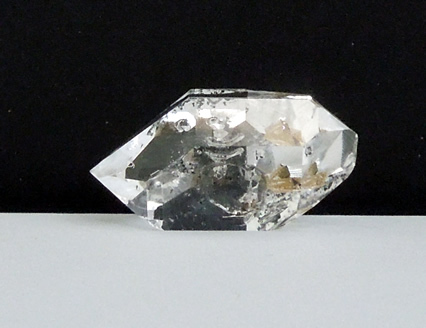 A quality Herkimer Diamond w/ fluid filled pocket (enhydro).